Tracking apps help you find lost items, but the MagHive prevents you from losing things in the first place. PITAKA, a leader in personal carrying systems, introduced MagHive, the world’s first smart reminder system at CES 2018. The MagHive app and hardware can make critical times like keys, wallets and headphones attachable to a base station that will remind users not to leave home without their essential items. Getting into the car without a wallet or purse, or heading off to the gym without earphones will be a thing of the past thanks to MagHive. Amazon Echo Dot and Google Home compatibility make it smarter than any device tracking solution. The MagHive is the first smart home device that can store and organize any personal item--keys, phone, earphones, purses, and wallets--or anything else consumers rely on but frequently misplace or forget. It can even suggest the user grab an umbrella if the forecast calls for rain. Paired with Amazon Echo Dot and Google Home, users can add voice control and the personal assistant to make the MagHive even more helpful. 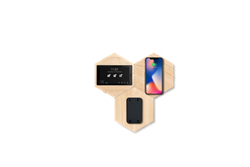 The MagHive system consists of a mobile app for IOS and Android smartphones, along with a magnetic, NFC/RFID-enabled, wireless-charging base station with fobs called MagTags that can make any personal item pairable. Reminders can be customized and triggered by motion and even by events like the weather. Reminders can also be sent to friends and family. MagTag NFC/RFID-enabled fobs for wallets, purses, keyrings, etc. Any metallic items can be attached to the base station, and any QI-chargeable item can be charged at the same time. Any time an item is moved, the display module issues an alert and sends preset reminders to the phone. The Echo Dot was Amazon’s best selling product for the 2017 holiday season as people welcome technology into the home to automate routine tasks. While Amazon and Google battle for the living room, PITAKA targets the entryway--the last checkpoint before leaving the house. Alexa can now remind you to grab your wallet. The MagHive’s patented NFC capabilities detect motion and communicate using NFC/RFID technology. The hexagonal design of the base station is fully modular. The PITAKA MagHive is at the stage of creating manufacturing samples. The product will be readily available in Q1 2018, through the Kickstarter crowdfunding platform. For more information visit https://maghive.ipitaka.com. Email: bill(at)alanizmarketing(dot)com; Phone: +1 (707) 338-1674.